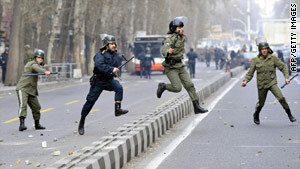 Iranian riot policemen pursue opposition supporters during protests in Tehran on December 27, 2009. Tehran, Iran (CNN) -- Sixteen opposition protesters went on trial Saturday in Iran on charges that they tried to overthrow the government, state-run media said. Their court appearance came two days after the government executed two dissidents -- an act that drew international condemnation. There was no immediate word on the outcome of Saturday's court appearance. The demonstrators face charges linked to anti-government protests during the December 27 observances of Ashura, a major Shiite Muslim holy day. They are accused of plotting against the establishment, rioting and conspiring against the ruling system, and violating security regulations, according to the semi-official Iranian Students News Agency. The Ashura clashes between security forces and anti-government demonstrators were the bloodiest since the post-election protests last summer. The 16 also are accused of sending videos of the demonstrations to "foreign hostile networks," according to the official Islamic Republic News Agency. Five of the defendants, including two women, are accused of "moharebeh," or defying God, a charge that could carry the death penalty, the ISNA said. Opposition protests were launched after the disputed June 12 presidential election that gave hardline President Mahmoud Ahmadinejad a second term. The government denies accusations of fraud. About 4,000 people have been arrested in the post-election crackdown. As of January 24, the government had confirmed the deaths of at least 37 people in the protests or in detention, seven of those deaths happening on Ashura. In coming weeks, Iranians will hold mass rallies around the country to celebrate the 31st anniversary of "Revolution Day" on February 11, when the Islamic Republic of Iran was created. CNN's Azadeh Ansari contributed to this report.